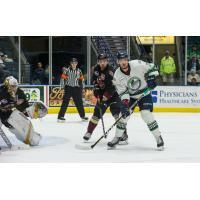 ESTERO, FL - Steven Lorentz and Michael Kirkpatrick each posted two points to lead the Florida Everblades to a tightly contested 3-2 victory over the Atlanta Gladiators in Game Two of the South Division Semifinals on Tuesday night at Germain Arena. The Blades got on the board first with 1:04 to play in the opening period on a goal by Steven Lorentz. Lorentz drifted to the slot with the puck and fired it through traffic and eventually through the five-hole of Atlanta goaltender Dan Vladar. The puck squeaked through the wickets and trickled over the goal line to give the Blades a 1-0 lead heading into the first break. Things got physical late in the second period as a few scrums, words and a scrap featuring Mitchell Heard and Tanner Pond took place to up the intensity. However, the Blades added to their lead with 35.3 seconds to play in the middle frame. Michael Kirkpatrick and Joe Cox caught the Gladiators on a change and rushed in on a 2-on-1. Kirkpatrick fired a shot off of Vladar's left pad for a juicy rebound that came right to Zack Kamrass who had rushed in behind the play. Kamrass took no time at all to crank it past the outstretched Vladar for the tally. With the goal, the Blades extended their lead to 2-0 as they entered the second intermission. The Gladiators cut the lead to 2-1 just 1:58 into the third. Following a delayed penalty, the Gladiators entered the Florida zone and Phil Lane sent a pass low in the right circle to Derek Nesbitt who was able to beat Ouellette on the far side net. Michael Kirkpatrick extended the Blades lead to 3-1 with 2:06 to player. Joe Cox and Kirkpatrick broke into the zone on a 2-on-1. Cox skated into the right circle before he sent a perfect pass to Kirkpatrick om the opposite wing. Kirkpatrick took the puck to his backhand as Vladar extended his pad, and swing his shot just enough for the goal. Trailing by two, the Gladiators pulled Vladar with a little under two minutes to play and got one back on a one-timer blast from Ben Danford with 21 seconds to play. However, it wasn't enough, as the Blades were able to grind out the final 21 seconds to take the game by a 3-2 score. Martin Ouellette stood tall in net for the Blades as he stopped 27 of the 29 shots fired his way. Vladar once again put forth a solid outing allowing three goals on 29 shots faced. Discounted Group Tickets: Bring your group of 10 or more to a game at a discounted price! Group tickets are available for all home games. Fundraising opportunities are also available. For more information on group tickets, call 239-948-7825, or stop by the Everblades offices at Germain Arena Monday thru Friday from 9:00 a.m. to 5:00 p.m.